Fire Project does SITC of GST100 Addressable Fire Alarm Control Panel, which is GST’s new generation mini-panel. Wall-mounted, unique design for modern technology, flexible configuration and easy to operate. Suitable for small establishment such as small offices, shops, restaurants, bars, libraries, supermarkets, transformer substations etc. The panel displays the zone, time and address with graphical icon once fire and fault occurs this is saved on a non-volatile memory, which can store up to 999 fire messages and 500 for fault. 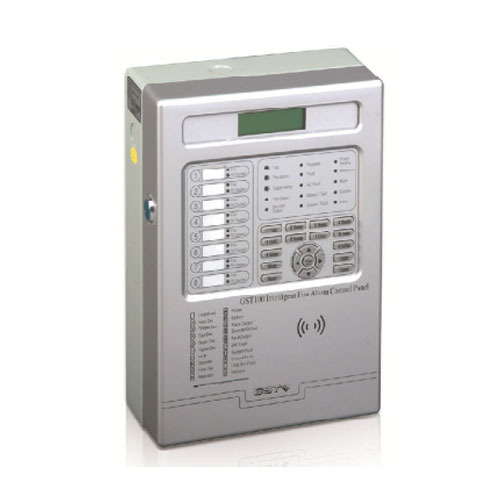 By utilizing advanced GST Protocol, the system is compatible with the complete range of GST intelligent detectors, sounders, interface module and MCP, and optional RS485 protocol for connecting repeater or networking to other GST intelligent panels. Client who want to replace their conventional panel with addressable fire alarm control panel, Fire Projects recommend GST 100 addressable fire alarm control panel as it provide benifies of cost effectiveness and its also support networking to other GST addressable fire alarm control panel. Selecting Fire Projects for new implementation of GST 100 for entry level addressable fire alarm control panel that is cost effective way for small to medium size organization, offices and library. We support our clients from Designing up to Commissioning up to AMC. We also provide AMC–Annual Maintenance Contracts for all types of Fire & security Systems. If you required new installation or AMC of fire alarm system, contact Fire Projects today! Schedule your appointment with Fire Projects on contact number +91 9409535460. • Loop capacity 128 addressable devices.